Check out the ReVisioning Values Conference in Portland! Springboard Innovation in Portland is putting on what looks to be a great conference to connect with like minded individuals seeking to be change agents for local communities and the environment. 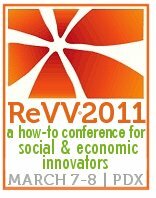 ReVV2011 is a how-to conference for entrepreneurs and finance working to create economic and social wealth in communities. It is building the ecosystem for new kinds of entrepreneurial and funding strategies, focused on helping attendees learn how to integrate the most promising innovations into day-to-day business and planning for the future. From nonprofit leaders to social entrepreneurs, this is the conference to attend. For more information please see www.revisioningvalue.org or call 503-452-6898. I look forward to making new and sustainable connections on March 7 & 8 in downtown Portland!